In another 10 years the studies of science, technology, engineering and math (STEM) could be as pervasive and effective in the K-12 classrooms of America as the use of the blackboard was at the launch of the 19th century. An aspirational vision for STEM education is set out in a 73-page report just issued by the American Institutes of Research and written by one of the foremost national experts on the subject. As "STEM 2026: A Vision for Innovation in STEM Education" summarized, "The complexities of today's world require all people to be equipped with a new set of core knowledge and skills to solve difficult problems, gather and evaluate evidence, and make sense of information they receive from varied print and, increasingly, digital media. The learning and doing of STEM helps develop these skills and prepare students for a workforce where success results not just from what one knows, but what one is able to do with that knowledge." 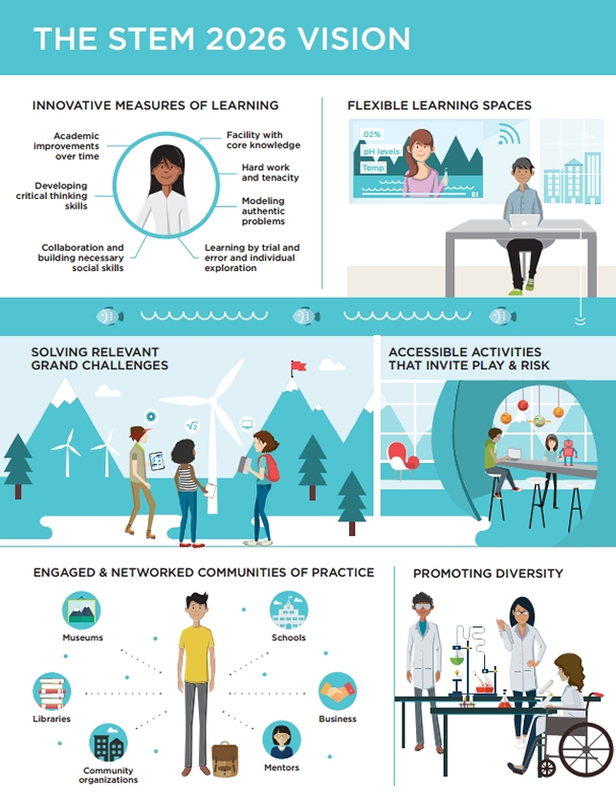 A new report from American Institutes of Research lays out an aspirational vision for the next decade of STEM education. A strong STEM education, author Courtney Tanenbaum, noted, "is becoming increasingly recognized as a key driver of opportunity, and data show the need for STEM knowledge and skills will grow and continue into the future." The challenges of achieving STEM for all are daunting. Recent results from the National Assessment of Educational Progress, for example, showed that 43 percent of white students and 61 percent of Asian students scored at the proficient level in eighth-grade math, while only 19 percent of Hispanic students and 13 percent of black students did so. Eighth-grade students with disabilities and students eligible for free or reduced-price lunch scored nearly 30 points below their peers in science and mathematics; English learners scored almost 40 and 50 points below their peers in those two subjects. STEM 2026 offers ways to reverse these trends, by providing examples of promising programs from around the country. Promotion of diversity and opportunity in STEM for all students to counter the stereotypes and "mitigate" the historic biases that have beset STEM fields. With those elements in place, by 2026, "all members of the community [will] feel invested and empowered to engage in STEM teaching and learning," the author wrote. STEM won't be "perceived as being thrust upon them or outside their purview but as culturally appealing and relevant." People will understand where STEM fits into their lives, no matter what their "race or ethnicity, disability, language spoken, gender, neighborhood or geographic location." "Effective STEM education that's accessible and inclusive of all students is increasingly important," said Tanenbaum in a prepared statement. "In today's world, all youth need teaching and learning experiences that empower them with the belief they can understand and shape the world through STEM." The full report is available on AIR's website.